Drains are wonderful when they work properly. But when they don’t work properly, they’re a headache to deal with. With Vito Services in the Washington, DC, area, you’ll never have to. We know drains inside and out—literally! When there’s a problem with your drains that you can’t see, we’ll get to the bottom of it with our sewer video technology. No matter how the problem started, clogged drains and sewer lines don’t stand a chance against us! What’s Wrong With My Residential Drains? Sewer backups are an unfortunate but common problem in U.S. cities and towns. Although municipal departments make every effort to prevent such incidents, they still occur. For the do-it-yourself type, drain and sewer problems can be especially frustrating. That’s because unlike many problems that are often right in front of you, these problems are typically located underground. Using advanced video technology, our sewer line inspections eliminate guesswork. Our camera will delve deep into your system and point right to the problem. From there, we’ll recommend either a drain cleaning, sewer line repair or sewer line replacement. Hydro jet cleaning is a form of drain cleaning service that is often the most effective way to clear stubborn drains. As part of our drain line services in Montgomery County, MD, (Silver Spring, MD), Prince George’s County, MD, Alexandria, VA, and throughout the tri-state area, we use industry-leading equipment for your home. Hydro jet cleaning is especially effective if your drain or sewer line has been clogged over time with heavy-duty residue such as grease, soap or sand. Sewer pipes play an integral role in removing waste. So, when something’s wrong with your pipes, you need the problem fixed fast. That’s where Vito Services can help. We specialize in sewer repair services and sewer replacement service in Washington, DC, and throughout our service area. We’ll examine your sewer system and consider a number of factors such as pipe material, pipe age and more. From there, we’ll use our findings and expertise to determine the appropriate action, whether it’s sewer repair services or sewer replacement service. We also offer both trenching and trenchless methods to provide a solution that fits your needs and your budget. Don’t let a problematic sewer line disrupt your day and peace of mind. Vito Services has spent years improving sewer lines for our customers—and we can do the same for you! Since 1934, Vito Services has been providing quality drain line services and products to residential customers in Alexandria, VA, and across the tri-state area. Whether you have a leak, stoppage, backed-up drain or you need a new fixture installed, we can meet all of your plumbing needs. Click here to see all of the towns we proudly serve. Stubborn drains have no place in your home. 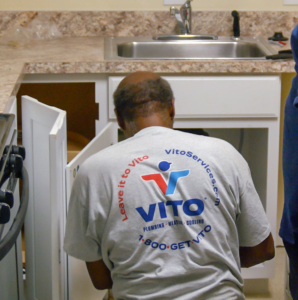 For an affordable solution you can trust, contact the experts at Vito Services. We have the tools, training and technology to fix the problem and get your sewer line working smoothly again, just as it should be. To schedule drain cleaning service, call your local Vito Services office or schedule an appointment online today. Choose an appointment time that works for your schedule.